Does It Matter How You Define Loyalty? Every client I speak with says they want to drive customer loyalty, but very few can actually tell me who their loyal customer is. They will respond to my question by painting this picture of a persona their marketing or brand strategy team dreamed up. Somewhere in their explanation, they will tell me about their new loyalty program and how enrollment is climbing. What always troubles me is their definition of a loyal customer isn’t based on, or even supported by real data. So, if a company can’t truly define loyalty, how do they drive customers towards becoming more loyal? And what purpose does that new loyalty program serve? If you ask a customer if they are loyal to a particular business, they’ll say something like when I need something they might offer, I give them the first chance to earn my business. A statement like that is a window into their likelihood of remaining a customer, purchasing again, and advocating on behalf of the business. In the age where customer experience is a true differentiator for your business, our thinking around what defines loyalty has evolved. Some experts would argue that loyalty can’t be defined solely by a transaction perspective, because instilling loyalty requires a great customer experience; one that is characterized by more than just a purchase and more so as a series of positive interactions that reinforce a customer’s trust and preference to a brand or business. As much as I agree with this belief, at the end of the day, if a customer’s behaviors can’t be directly or indirectly attributed to sales, then they shouldn’t be considered loyal. For example, when I need to buy new clothes, I always check out Bonobos first. I’m on their site, I have their mobile app, I subscribe to their emails and I recommend their clothes to everyone, but how much do I spend with them? Very little, because I’m super cheap. So, I’m loyal to Bonobos, and lower prices and promotions will keep me coming back, but I’m not a profitable customer. Your definition of a loyal customer should not overlook the impact of the broader customer experience, but it should be rooted by transactional data. I would recommend a combination of total spend, purchase frequency, and type of products purchased. All three? Yes. Consider the changes Starbucks introduced a couple years ago to their loyalty rewards program. In short, they determined their ideal customer isn’t the one who spends $3 for basic drip coffee, doesn’t matter how much they spend annually. Their ideal or loyal customer was someone with the highly-customized order who also picks up items from the food menu and buys Starbucks branded items. That plain coffee drinker can get a cup of coffee from just about anywhere and there would be very little Starbucks could do to stop them. Starbucks is rewarding the customers that maximize their return on investment with Starbucks and offering incentives to continue those behaviors. By grounding their definition of loyalty in the transaction, Starbucks utilizes its rewards program as a lever to drive all customers toward a defined state of loyalty. We can never overlook the importance of measuring net promoter score as a measure of advocacy, but your company’s definition of who the loyal customer is shouldn’t stray too far from the transaction. Remember, data is key; more specifically, customer, product, and transaction data are key. It is easier said than done, but in order to measure loyalty, all purchases or transactions need to be strung together and associated with the correct customer. In most cases, especially in the omnichannel commerce world, that’s a lot of data wrangling, if you do not have the right governance and systems in place. However, when you have your data organized, individual customer loyalty scores can be generated combining the factors that define loyalty. It’s best to place the most weight on transactional data; spend, purchase frequency and type of product purchased, but other factors including engagement can offer a more holistic view of loyalty in the context to the broader customer experience. For example, do they visit your website, do they have your mobile app, and do they require a promotion to convert. These additional data points not only allow you to more effectively segment customers, but the patterns you identify in how your loyal customers engage will offer more context around why they buy, and also serve as the basis for your loyalty marketing strategy. Ok, so you have defined who the loyal customer is and you have put a measurement framework and process in place to make sure you continually analyze and score your customer loyalty. What comes next? Sit back and hope your newly polished website inspires customers to spend more, buy more frequently? Obviously, no. By taking a data-driven approach to defining loyalty, your business can put a number of different marketing and loyalty programs in place to drive repeat or similar behaviors from your broader customer base. Just as Starbucks uses their rewards program as a lever to drive customers toward purchasing at certain times or buying specific products, your business can do the same through the levers available to you. A recommendation engine on your website can inspire customers to purchase from new product categories and an email campaign can inspire customers to download your mobile app. Every touch point and interaction your company has with a customer is an opportunity to build loyalty. The most important thing is you know which levers to pull, and when and why to pull them. My favorite approach to driving loyalty is from a company I worked with in the past called, Coherent Path. At the time, they were developing a very sophisticated customer loyalty analytics solution that leveraged a mathematical concept called Hyperbolic Geometry that allows them to digitally map a company’s product and transactional space (think about it as a map of our galaxy). It’s through this map that they were able to analyze an individual customer’s loyalty by where they are today (how much they buy or what they buy) and then calculate a unique series of campaigns and products a customer should be presented on their journey to becoming an ideal consumer (buy more of this and spend more on that). They also took into consideration the speed and frequency of engagement to keep a customer moving forward in their journey. In short, they could systematically devise a plan to drive loyalty through recommendations and email campaigns that gradually influenced a customer’s behaviors. Sophisticated technology, yeah, but their approach is what you should pay attention to. 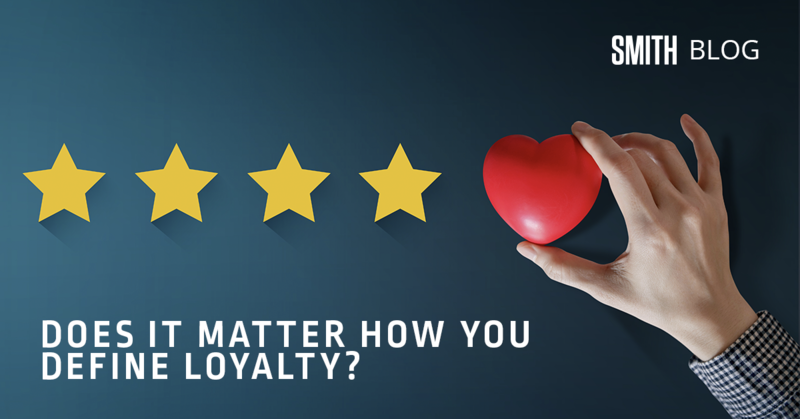 If you can define loyalty, the definition becomes your company’s north star; it influences how you engage your customers and it shapes how you structure a loyalty program to ensure its success drives the behaviors you would use to characterize who your loyal customer is. So please, before you start trying to drive loyalty, take a step back to define it first. You don't have to do it alone, we'd love to help. Drop me a line Chris.Palmer@smith.co.